Mandurama Memorial Park commemorates the men of the district who lost their lives in World War Two and honours those who served. The entrance gates contain the names of those who lost their lives in the conflict. 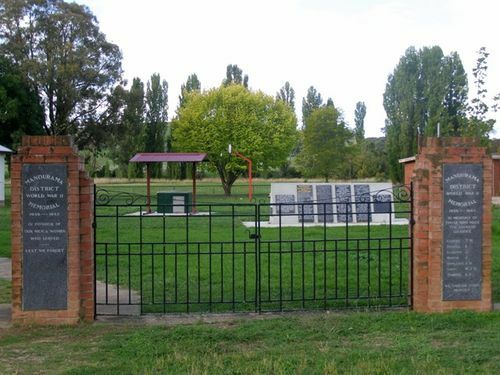 It is estimated that a thousand people attended the Ceremony of Dedicating Mandurama' s War Memorial Park on the afternoon of Anzac Day — five times the population of the village. The Memorial commemorates the seven young men of the district who lost their lives in World War II, -and Honours all who Served. Mr. James Ashton, Chairman of the Control Committee was in charge of the proceedings, and the Dedication was by Cr. J. A. Innes, Chairman of the Central Tablelands County Council. The Entrance Tablet of Honour was unveiled by Mrs. Carney and Mrs. Davies. The Entrance Tablet of Memory was unveiled by Mr. Coy and Mr. Rex Rothery. Excerpt from Lyndhurst Shire Chronicle (NSW), 29 April 1953.